Go Ruck | Yes, I Love You Too. Yes, I Love You Too. The things I want to share with you – try to enjoy this short life you have! SO – I said I would post about the Go Ruck Challenge ( https://www.goruck.com ) once I completed it and I haven’t … until now. They say that anyone can complete the Challenge, as long as you are willing to stick it out and get over any kind of “tiny heart syndrome” you might have. They say that it is a team event and that “teamwork is the key.” Well, what they say is true. After having only really, REALLY exercised maybe twice since my daughter was born (7 months old when the challenge rolled around), I hopped into our car with my husband at about 11:00pm and made the trip to our start point at the Space Needle in Seattle. I wasn’t sure what to expect even though I had been searching and reading as many blog posts as I could about a Challenge before the event. All I knew was that for the next 8 to 10 to maybe more hours, we would be rucking around Seattle carrying bricks and whatever else our cadre deemed necessary. 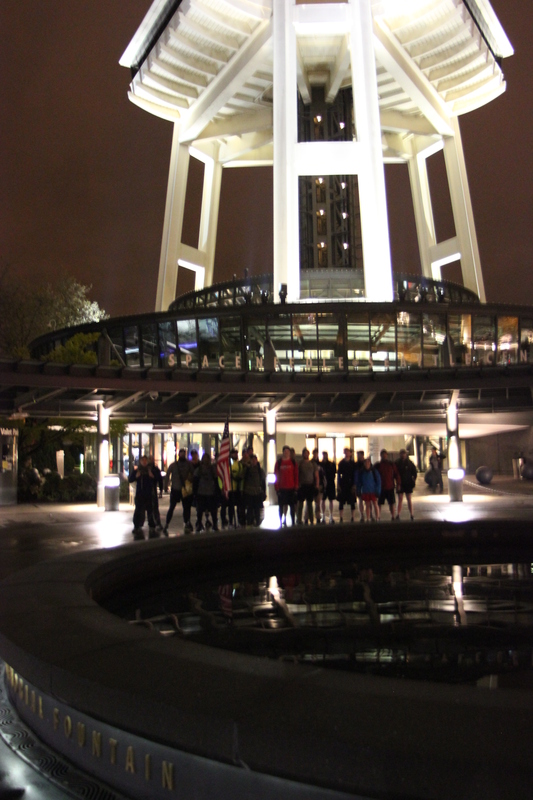 At the start point, we had a beautiful view of the Space Needle up close with all its lights on. We got to stand around for a little while and check out our teammates. Some we had met on mini-training get togethers, most were still complete strangers that we would have to work with to survive whatever lay ahead. Once our cadre arrived the fun got started. All cadre have a background in Special Ops and they love, almost seem to live on, making us do fun things like stay in the front leaning rest (push up position) and do flutter kicks (on your back, legs extended) while we get to learn about why they are a cadre and what Go Ruck means to them. We also did fun activities to learn each other’s names – like staying in the front leaning rest until we could go through and name every single person in our group of 25 strangers … without making a mistake. After our team hashed that out, we got started on our trek. The night was filled with fun. We learned a lot about our cadre – Cadre Bert. We mostly learned that he’s a fair guy. Meet your time hash to get wherever you need to go and he’ll be fair … miss your time hash by 03 seconds and he’ll still be fair. That’s where our bear crawls, crab walks, and relay race happened to us. With rucks on. What is in the ruck, you say? 4 to 6 bricks (depending on your weight), water, and whatever else you thought you were going to need but ended up realizing was just extra weight you had to carry around all night. 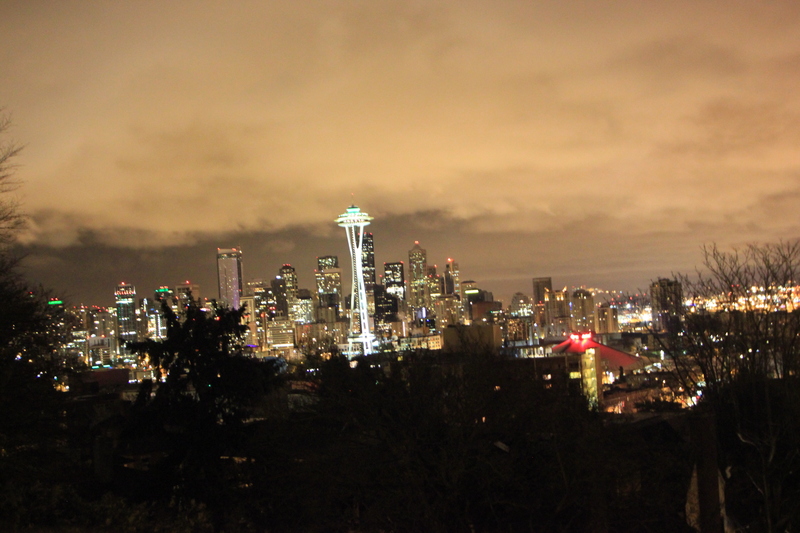 Throughout the event we had great views of the city at night and into the wee hours of the morning. 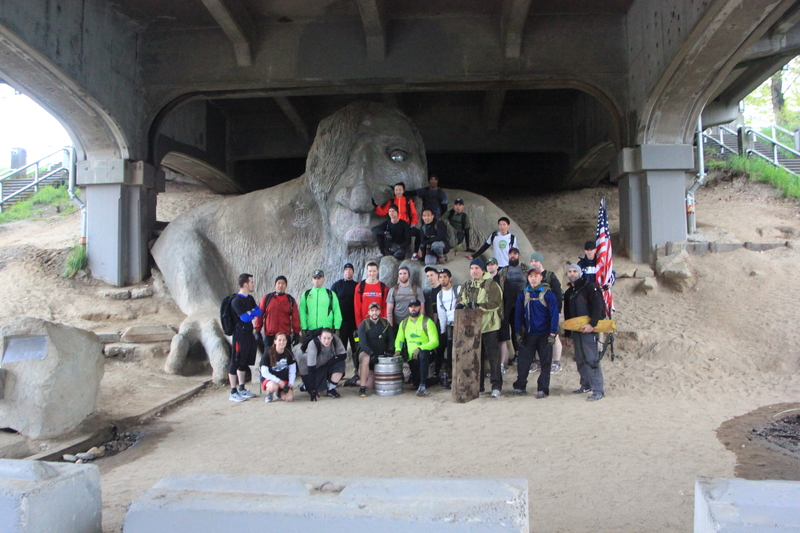 The team picked up a log to carry along the way in addition to our team weight (combined 25 lbs of Ernesto the wooden fish and Rainier beer cans), American flag, and the cadre’s keg. It was a night of good livin’. And you really do everything as a team. If you take on this event go into it with a “nobody gets left behind” attitude. One team, one fight. One of our teammates at the beginning said something interesting – don’t LET anyone quit because they will have to wake up tomorrow and look at themselves in the mirror knowing that they gave up. One of our teammates was badly injured just a few miles short of completing the event. He didn’t quit, he was buddy carried to the end. The team stayed with him and he finished with the team. I felt tons of support as well. There were moments where my knees were killing me, where I thought I wouldn’t make it because I’m a mom and this stuff is hard. But our team worked together, we kept a good pace and stayed motivated throughout the event. It also helped that Cadre Bert told us a story at the beginning that made a lot of sense. If you think you can’t go on because you’re “gonna die” then stop where you are and just die. It sounds ridiculous but you realize you are not in fact dying. And you keep on going. Anyone can get through a Challenge. It’s an interesting experience to have to pull together as a team in such a short span of time with complete strangers. But I wholeheartedly recommend taking on the Go Ruck Challenge. It’s an event you won’t forget. When my husband told me he signed us up for this challenge I immediately started reading as many blogs as I possibly could about this event. 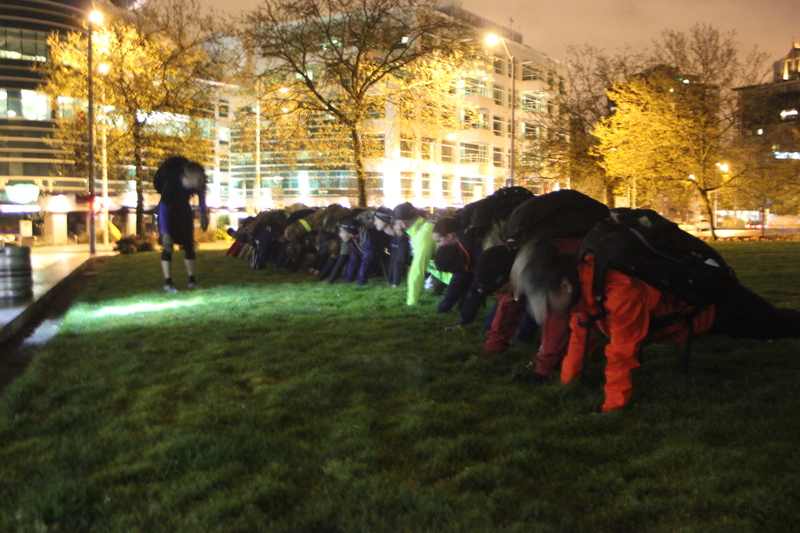 I concluded the Go Ruck Challenge is a slightly scary mystery. What I do know is that you have to carry a ruck around the city hosting the event for 8 to 10 hours, covering about 15-20 miles, while doing all kinds of energy exerting exercises with a group of strangers who make up your team. I hear it involves buddy carries, bear crawls, log carries, and lots and lots of water. I am ready. And excited. 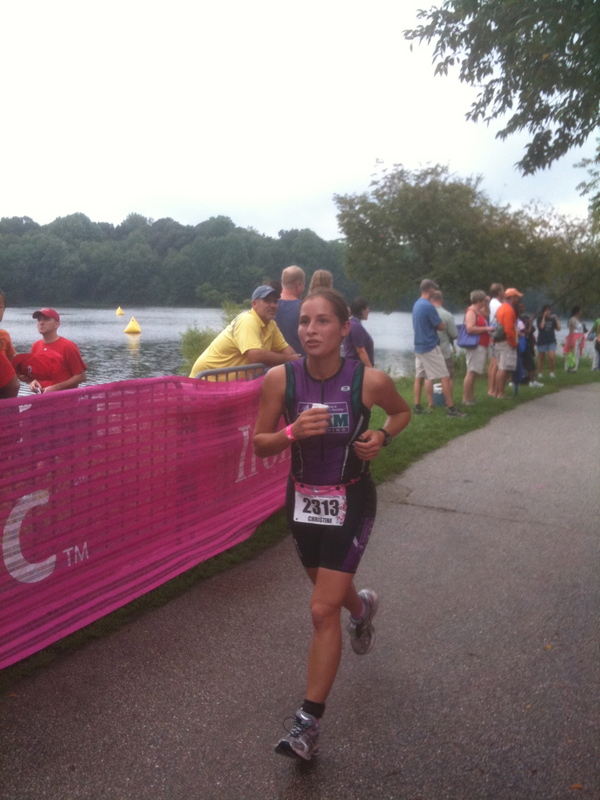 After competing in the Iron Girl Triathlon I was hooked. I wanted to compete in other sprint triathlons with the goal of bumping up to the olympic distance triathlons. Since it has been a few years, I plan to start here. This event highlights the fight against autoimmune diseases. Another event right up my alley. Well, this event just looks like fun. And if we can get a sitter, I am looking forward to taking on mud, ice cold water, and getting shocked throughout the course with my loving husband. The Warrior Dash gave me a hunger for fun, but oh-so-challenging events. Tough Mudder, quench my thirst. I am excited about these three events and I plan to add others throughout the year! Color runs, zombie survival runs, bikes throughout Washington state. There are so many challenges out there and I am ready to take them! Ernesto the Cedar Fish is our team weight for our upcoming Go Ruck Challenge (14 days away). We’ll be carrying him, along with his Seattle appropriate slab of wood, on our 15-20 mile trek. Who knows what kind of events he will be enjoying with us! The slab is still a work in progress. Look forward to posting pictures of Ernesto’s Go Ruck adventures! Click to follow this blog and receive email alerts when I post something new!